A man stands behind a counter. On the counter a sign says: Paint. A woman approaches the counter. Woman: Hi, do you have blue dot four? Man: Ma'am, there's no such color. The next panel shows only the man, in a closer view. 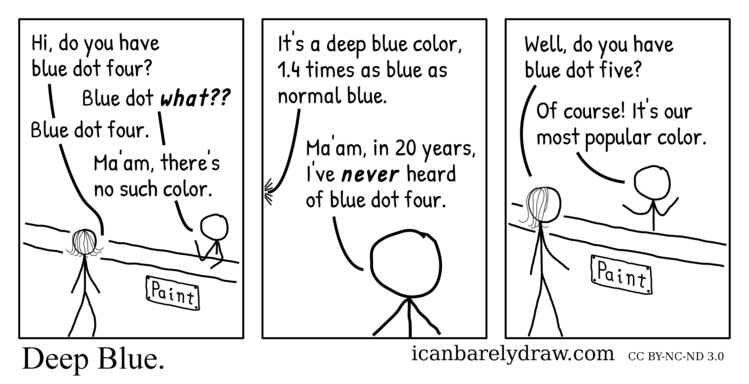 Off-panel voice: It's a deep blue color, 1.4 times as blue as normal blue. Man: Ma'am, in 20 years, I've never heard of blue dot four. The next and final panel shows the man and the woman, similarly situated, in a slightly closer view. Woman: Well, do you have blue dot five? The man is seen gesticulating with his arms. Man: Of course! It's our most popular color.